The Queensland Government is planning to begin construction of The Dreaming Track in 2011. 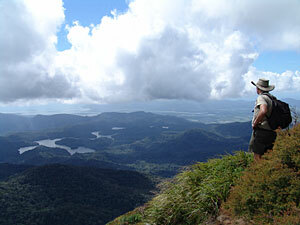 The Dreaming Track will be a combination of trails that will join the Daintree to the tip of Cape York. Four weeks is the recommended time frame if you wish to do the 2000 km trail passing through the Daintree Rainforest, Cooktown, Laura, Lakefield, Coen, Lockhart, Heathlands and Bamaga. Walkers of the Dreaming Track will experience rainforests, isolated mountain ranges, mangrove forests + rivers, grasslands and scrub. Premier Anna Bligh said the Dreaming Track would rival the world’s greatest and most popular walks including Kokoda and Milford Sound. “This dreaming track concept originated from Balkanu and Traditional Owners of eastern Cape York Peninsula” Ms Bligh Said. “Together, this network of walking experiences will rival the world’s greatest and most popular walks including Kokoda and Milford Sound,” Ms Bligh said. South Australia’s Heyson Trail is currently the longest walking trail in Australia at 1200 kms. If the call of the natural world entices you to take on the Dreaming Track, then the perfect location to relax and recuperate from your experience is Thala Beach Lodge. This tropical rainforest region features Daintree National Park which is part of the Wet Tropics World Heritage Area. The Park consists of long sandy beaches, rocky headlands and steep mountain ranges intersected by numerous creeks and rivers. One of Australia’s last extensive stands of lowland rainforest is found here. Impenetrable ranges, rising steeply from the coast, are blanketed with dense upland rainforests that support many ancient plants and animals. 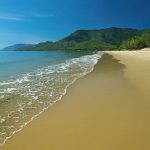 This part of Far North Queensland also features Cape Tribulation and Cedar Bay National Parks. The terrain is marked by rugged Mount Cook which provides a scenic backdrop to the township of Cooktown and is part of the nearby Mount Cook National Park. The Park terrain comprises rainforest and tropical woodland. Heath understorey (a type of vegetation) covers Mount Cook’s upper slopes and sheltered gullies, while grasslands grow on the southern slopes. The Laura region is the centre for the largest collection of prehistoric rock art in the world. About 100 km from the township of Laura is the Alwal National Park which features terrain of escarpments, undulating low hills, seasonal wetlands and patches of vine-thicket. This region features Lakefield National Park and Cape Melville National Park, each with unique terrain.Lakefield National Park is renowned for its vast river systems and spectacular wetlands. During the peak wet season the Normanby, Morehead and North Kennedy Rivers flood creating an extensive wetland system of lagoons, billabongs, swamps and lakes which support numerous birds and other wildlife. To the north, the park features impenetrable mangroves along the estuaries and coastline of Princess Charlotte Bay. Behind the coast are extensive salt flats and the marine plains that give way to inland tracts of eucalypt and paperbark woodlands. Cape Melville National Park on the other hand is characterised by the Melville Range which extends inland from Cape Melville, featuring massive tumbled granite boulders and unique vine forest. Natural features of the park also include grasslands, tidal floodplains and extensive mangroves. Iron Range National Park is a coastal park with spectacular views from the beaches and headlands to the heath-covered Tozer Range, which rises 543m above sea level. It encompass internationally significant terrain including lowland rainforest, open forest woodland and heath vegetation. The Jardine River National Park and Heathlands Resources Reserve terrain features wetlands, vineforest, heathlands, savanna and coastal systems. This vast, remote wilderness is an ancient sandstone landscape. Sediments laid down when the area was a shallow sea have been shaped over millions of years of weathering to form today’s gently undulating landscape. Clear fresh water is abundant, not only in the mighty west-flowing Jardine River, which dominates the landscape, but also in swamps, boggy gullies and numerous smaller streams. Bamaga and its surrounding communities are located north of the Jardine River. The 4WD drive trip on the way to Bamaga region is known for its rugged terrain. 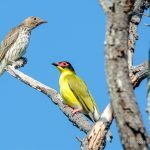 The region provides easy access to Thursday Island and located nearby is the Lockerbie Scrub, a 230 km area of lowland rainforest.